I feel like it's a crime to live in Texas and not have knit with madelinetosh yarn (I am very guilty of this). Thankfully, my LYS in Austin is stocked to the roof with this yarn so I got my mother to pick up a few skeins of madelinetosh's tosh merino light for (another!) upcoming design. 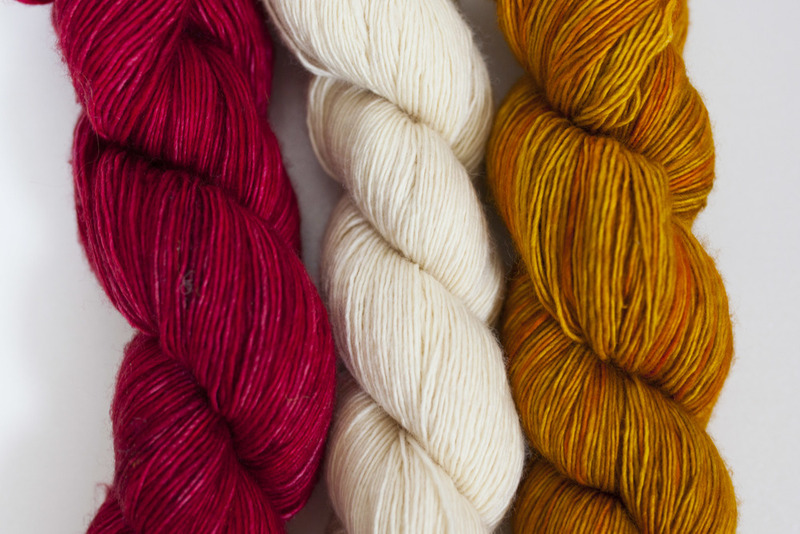 I'm not going to give too much away but it's a shawl that involves short rows, lace and these three colors. This is going to be a new design challenge for me, considering what I have in mind. Hopefully it all comes out well! I'll be working with this yarn near the end of the summer for an autumn release. Colorways: Heartbeat, Dandelion, Antler. All so squishy, all so soft, all so delicious and I want to eat them.